One of the biggest obstacles that students face when studying is how to keep finding new things to practice and how to make their practice time as efficient as possible. In the 30 Days to Better Blues Guitar eBook you will find a month long practice routine with a lesson a day on a topic covering some of the basics and most fundamental principles of Blues Guitar playing. During that month each short lesson will improve your knowledge of soloing, licks, scales, arpeggios, chords, harmony, phrasing, ear training and sight reading. 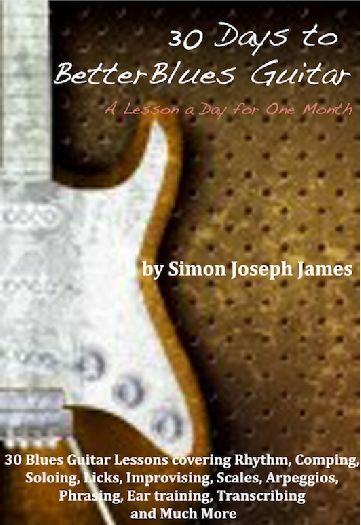 The aim of this Book is not just to give you a list of progressions and solos to learn but is to hopefully open up new possibilities for playing the Blues on the guitar and to provide an insight into the authenticities of the Blues tradition that have been evolving over the last 150 years. As well as providing you with a routine of practice for 30 days, the lessons in this book guarantee to provide you with enough ideas for many extra weeks of further practice when the initial month is at an end.